(Nanowerk News) It turns out that wearing a cap is good for you, at least if you are a mammal cell. Researchers from the Johns Hopkins Engineering in Oncology Center have shown that in healthy cells, a bundled “cap” of thread-like fibers holds the cell’s nucleus, its genetic storehouse, in its proper place. Understanding this cap’s influence on cell and nuclear shape, the researchers say, could provide clues to the diagnosis and treatment of diseases such as cancer, muscular dystrophy and the age-accelerating condition known as progeria. 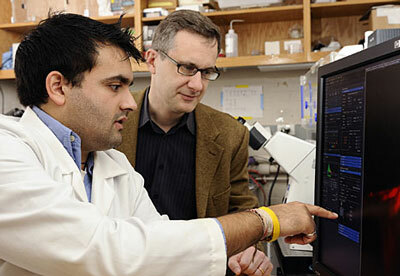 Doctoral student Shyam Khatau, left, and Denis Wirtz, director of the Johns Hopkins Engineering in Oncology Center, played a key role in finding a bundled “cap” of thread-like fibers that holds a cell’s nucleus in its proper place. Scientists have known that misshapen nuclei are an indicator of disease, Wirtz said, but they were not certain how a cell controlled the shape of its nucleus, the structure in mammal cells where genetic material resides. In a study published in the Nov. 10 issue of the Proceedings of the National Academy of Sciences, however, the research team led by Wirtz reported the discovery of a fibrous structure that holds the nucleus in its place. The researchers call this new network structure the perinuclear actin cap. Wirtz said. This configuration pushes the nucleus down toward the base of the cell and also creates the distinctive flattened shape of normal cells. Cells with cancer, muscular dystrophy or progeria, however, lack this distinctive cap, allowing the nucleus to float upward toward the top of the cell’s membrane. These diseased cells may appear more rounded and bulbous. The perinuclear actin cap was discovered while the team was trying to find out if cell shape controls nucleus shape. By growing cells on a surface with alternating sticky and non-sticky stripes, the researchers noticed that as cells grew along a sticky stripe, their nuclei elongated as well. Using a confocal microscope — a special kind of microscope that can view an object one “slice” at a time — doctoral student Shyam Khatau was able to reconstruct the cell in three dimensions. By stacking the confocal microscope images together, Khatau, who is affiliated with the Johns Hopkins Institute for NanoBioTechnology, was able to produce short movies showing the 3-D structure of the cells, the nucleus and the perinuclear actin cap. “We next plan to study how the cap’s effect on the shape of the nucleus affects what genes the cells express,” said Wirtz. Khatau, who is pursuing his doctorate in the Department of Chemical and Biomolecular Engineering, is lead author of the journal article. Additional Johns Hopkins authors on this paper are Wirtz; doctoral student Christopher M. Hale and senior Meet Patel from the Whiting School of Engineering’s Department of Chemical and Biomolecular Engineering; and Peter C. Searson, a professor in the school’s Department of Materials Science and Engineering. Other co-authors were P. J. Stewart-Hutchinson and Didier Hodzic from the School of Medicine at the Washington University in St. Louis and Colin L. Stewart from the Institute of Medical Biology, Singapore.